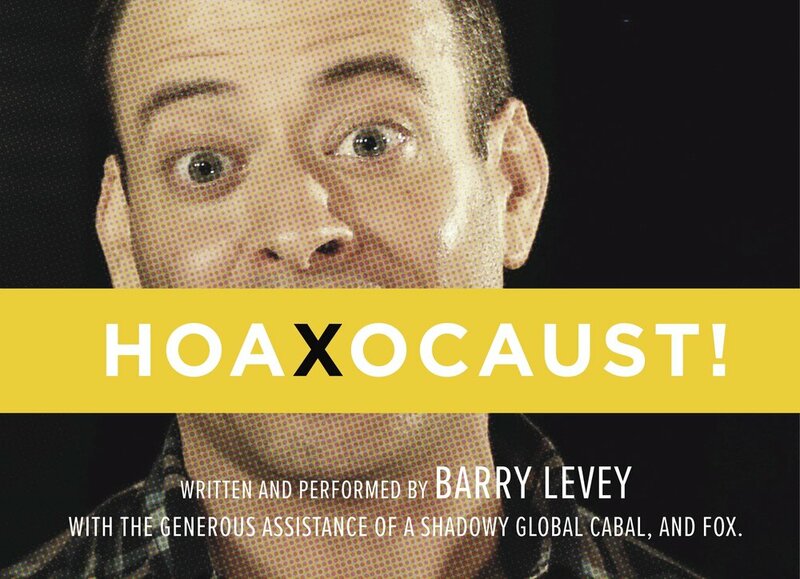 It's great to catch up with playwright/actor Barry Levey about his show Hoaxocaust!, which I first saw in 2014 Fringe Encore Series. I was moved by it then and I can't wait to see how it's changed now. It baffled in my mind in 2014 and it scares me in 2018 that some people out there truly believe The Holocaust never happened. They actually think it was made up, that it's "fake news." And thanks to THAT ONE in the White House, there is a rise in violence in this country. The times we live in have been compared to pre-war Germany. THAT ONE has been compared to Hitler. That is why, Barry Levey's play, Hoaxocaust! is more important now than ever before! Hoaxocaust! questions what roles should past horrors play in defining ourselves, our religious views, or even our politics? Is there such a thing as a contemporary Jewish identity independent of the Holocaust? Should there be? What if the Holocaust had never happened? Mahmoud Abbas has said it. Poland has said it. Some people currently running for our Congress and in our President's coalition have said it. If the Holocaust didn’t happen… what did? Join writer/performer Barry Levey on an around-the-world adventure as he tracks down deniers from Illinois to Iran, meets engineers and ex-presidents, and dodges a brother in Hungary and a boyfriend back home on a journey to discover the shocking truth. Hoaxocaust! will play at The Theater at The 14th Street Y (344 East 14th Street at 1st Avenue) from September 5-30. Click here for tickets! For more on Hoaxocaust! visit http://www.hoaxocaust.com and follow the show on Facebook and Twitter! For more on Barry visit https://www.questingbeast.info and follow him on Twitter! 1. It's so great to catch up with you Barry! I saw this show in 2014 when it ran at Baruch College. How has this show changed since then? The show has changed completely today since I rehearsed it last night, never mind how it's changed since 2014! It wrestles with fake news, and current events, and fake current events, so let's just say I rewrite nightly between commercial breaks of Maddow. Most significantly, it ends with a new interview subject. Ahmadinejad is no longer the big, international bad peddling damaging conspiracy theories. Email your guesses to info@hoaxocaust.com. 2. What has been the biggest change for you in these past four years? Personally? Oy. I broke up, moved out, and started over in Washington Heights with a new apartment and a new job. Find me on Grindr. 3. What are you looking forward to about this upcoming run? Everyone I know grapples with #resistance. Hoaxocaust! in 2018 feels like my way to engage in a dialogue of resistance with my fellow citizens. Anyway, it's a lot more active than sobbing through Maddow. 4. In this terrible climate we live in now, where that one has been compared to Hitler, how do you feel this show will take on new meaning? I don't know who you mean? 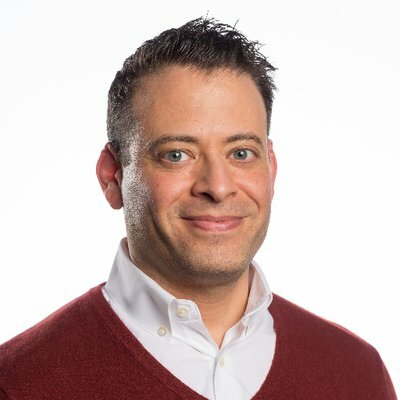 ADAM DON'T GIVE AWAY THE NEW ENDING. Just kidding; Trump does not appear in the piece. Attending a performance of Hoaxocaust! may actually be the only way to spend 80 straight minutes without him. But yes, we have eight white nationalists running for Congress in November and a president who dog-whistles to Nazis, and the piece tackles all of that head-on. With laughs! 5. Do you feel his presidency has brought more Holocaust deniers than when you first put this show together? Sociologists more learned than I debate whether he has actually created more bigots, or just fostered a more welcoming atmosphere for them to "out" themselves in. But either way: Yes. Charlottesville happened since you last saw this show. Trump endorsed a fake conspiracy about white genocide in South Africa just like week ago. There is no question that he is part of an environment that cultivates Truth Denial. Whether he's a catalyst or just part of the swampy habitat, either way he's scum. 6. Who was the scariest person you encountered during your tour of the world? I won't reveal the final two interviews, which are certainly the scariest in terms of my acting and the angry red lights we deploy for them. But I will say the way Arthur Butz manipulates the number of Holocaust deaths using "fuzzy math" caused me the most angst while writing. Realizing how easy it is to selectively edit from true facts to end up with something terrifyingly convincing and utterly untrue…I had to stop writing for a few days, I so freaked myself out. 8. In putting this show together, you left your mom and boyfriend, to search for the "truth." What was the hardest part about leaving them? Adam, you have a scary good memory! Well, I embarked on the journey to improve my relationships with both of them, especially my (non-white, non-Jewish) boyfriend who (rightly) questioned my identification with "victimhood" as a white, privileged, American male. As for how successful I was, I refer you to my answer to Question 2. 9. Did your boyfriend wait around for your return? If so, how do you feel your relationship was strengthened by this journey? If he didn't wait around, how do you feel him leaving and your exploring helped you grow? Oh, he waited for my return. That's when we had words; they're in the show. Come hear for yourself! As for how I've grown since…well I've subscribed to Purple Carrot, the vegan meal-kit delivery service, and I'm learning to cook. For myself. I'm hoping this proves an attractive attribute to the next boyfriend who precipitates an EXISTENTIAL CRISIS THAT PROPELS ME AROUND THE WORLD ONLY TO DESERT ME AFTER. 10. I have a component to my interviews called "I Can See Clearly Now," where I usually try to clear up misconceptions about my interviewees, but in this case I'd like to use it to clear up a misconception about the Holocaust. What do you feel is the biggest misconception out there about the Holocaust (other than it never happened)? I'd defer to scholars like Deborah Lipstadt to state definitively the most dangerous lie out there about the Holocaust. But broadly, one thing all my interviewees share is a conviction that somehow there is no "proof" of it. That somehow, all the eyewitnesses, and photographs, and diaries, and memoirs, and meeting minutes, and speeches, and censuses, and camp records, and kill reports, and work orders, and blueprints, and invoices, and forensic analysis, and testimony, and court verdicts, and international commissions…all…don't count? They share a very Giuliani way of defining "truth." I invite anyone who wants to gird themselves for a truth war to come get armed at Hoaxocaust! New York productions include Woman of Troy (Upstart Creatures), Maimed (Project Y), Hoaxocaust! (FringeNYC 2014 Overall Excellence Winner, Baruch Performing Arts Center, Theater for the New City, Prospect Theater Company); Critical Darling (The New Group); All the Way From China (Mad Dog at the Gene Frankel); and two shorts for Ars Nova, Downeaster Alexa and Yale Law School, the latter of which was a finalist for the Heideman Prize from the Actors Theatre of Louisville. Barry is a two-time O’Neill finalist whose work has been developed by Resonance Ensemble, the Lark, Arena Stage, Rattlestick, and Williamstown, among others. He holds a BA from Yale and an MFA from UC San Diego.